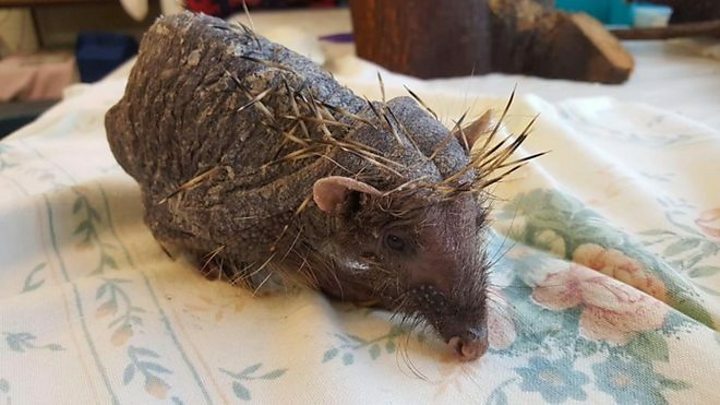 A bald hedgehog that has been receiving daily stress-busting massages has started to re-grow his spines. He has also gained weight, and the centre said it was "delighted" with his progress. Manager Fran Hill, said: "I was just so thrilled. "They have come through so beautifully evenly, the spines themselves look so healthy - and they are very sharp. "The future is looking very much brighter for him than it was." She said Bear had "doubled" in size, and now weighed 2lbs (907g) and had been building himself up on meals of meat, biscuits and gravy. "He has been a very patient patient," Ms Hill added. Ms Hill said Bear was now too "spiky" to massage, but his baths would continue and he had Evening Primrose Oil added to his food to help his skin. "His actual skin has not improved as much as we would have hoped," she said. 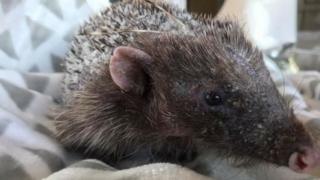 "Hedgehog skin is so delicate, but it is normally protected by their spines. "Because his was exposed for so long...it is going to take a bit of time to get it right."